MNJ, Računalniške rešitve, Matej Jakop, s.p. 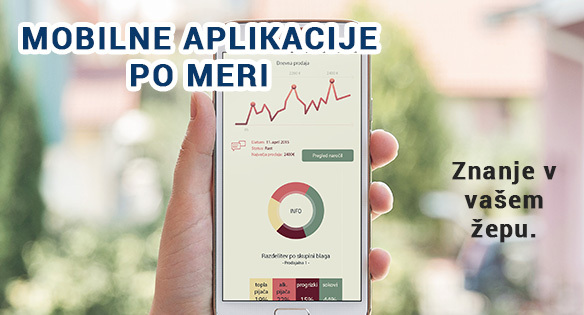 Optimizirajte svoje poslovanje z nami! We create quality custom made web applications. Automate processes and optimize required time and increase accuracy. With better overview over processing, automatization and reliability improve your productivity. Available over the internet. We keep application secure with authentication system and SSL certificates. From simple presentation mobile application to more complex bussiness tools. Knowledge is power. Have it always with you with mobile catalogs and special calculators. Capture events and send them in the back office in real-time for further processing. Our solutions works on all mobile phones and tablet with Android operating system. Automate repeating and boring tasks. Special software robot works for you. You select parameters and send robot to work. Take cup of coffer and relax while your works is still being done. Reduce number of mistakes with software robot. Posibility are endless. We automate all programs and webpages. Process WWW available data and gain new knowledge. WWW offers huge amount of infomations. With help of web spiders we collect data and with proper data processing we extract new knowledge. We select problem relevant metrics and do analysis. We prepare grafical report. With applying machine learning algorithms we can learncomputer to classify new samples. All completely ayutomatically. We are available for all your questions. We are happy to help. We are available for all your questions, advices and queries.